At this year's annual Longmore Lecture on Wednesday, March 2, we heard from scientist and inventor Joshua Miele, who discussed his take on "how access really happens." Dr. Miele holds a Ph.D. in psychoacoustics from the University of California, Berkeley, and is currently Director of the Description Research and Innovation Lab (DRIL) and Associate Director of the Smith-Kettlewell Rehabilitation Engineering Research Center on Blindness and Low Vision. As noted in an earlier post, Miele has spent nearly 30 years "designing and implementing a wide variety of tools intended to give blind people better access to the information they need to do the things they want to do." But this talk wasn't about the latest accessible technology. Rather, Miele began by reminding all of us that "disability, accessibility, equality and self-determination connects back with the history and culture of disability." His reigning mantra, which is echoed as a core tenant of the Longmore Institute, is that disability can spark creativity and innovation, and rather than letting everyone else figure out the best way to solve problems for "those people," innovation comes best straight from the source. 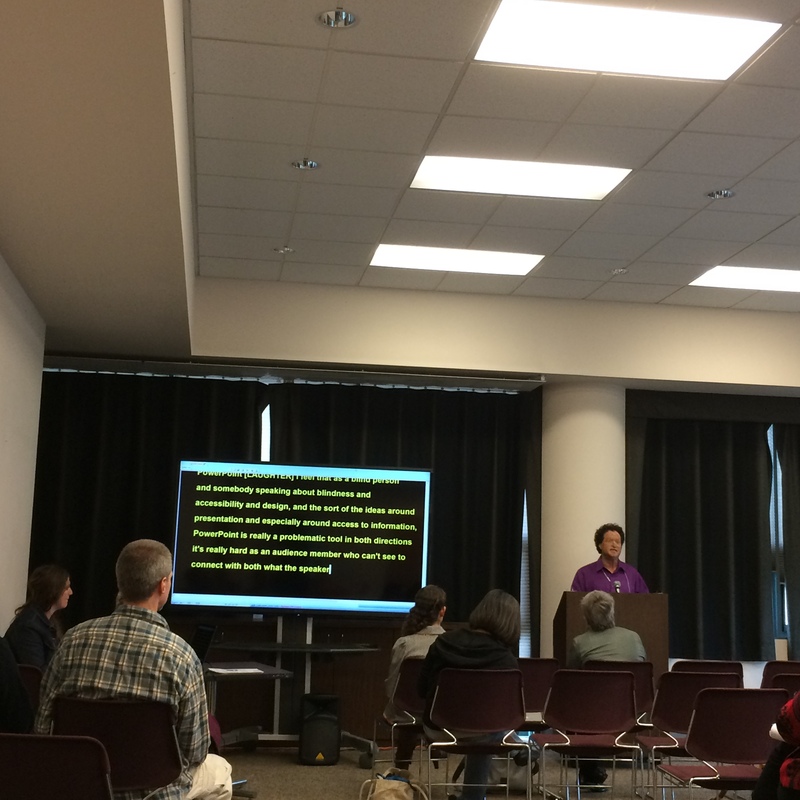 Dr. Miele shares some musings on the pros and cons of powerpoint presentations for blind speakers. Miele noted that "there is a big difference between independence and self-determination." He recalled his own journey both professionally and personally on how he was able to progress from adapting, to being in a position to help others. As a physics student, Miele relied on another low-vision scientist Abraham Nemeth's braille code for math and science formulas, along with his own additions. And with ever-increasing access to technologies and ideas, his work continues to figure out "how blind people can build the things that they need to build." One of his most compelling stories was of a childhood memory in a museum. He recalls his mother describing a display of airplanes, then waiting for a security guard to look away so that he could go under the rope and touch the planes himself as she identified them. Although he wasn't directly suggesting going beyond the ropes in museums (though many museums actually offer touch tours for low-vision visitors now! ), he illustrated the point that "Real access happens not by asking for permission but by asking for forgiveness after you have done what you need to do." This year's lecture was informative and entertaining, but also a call to arms to advocate for the access we really need. By working with expert innovators like Miele, we can make access really happen. Missed the lecture? Watch it here!